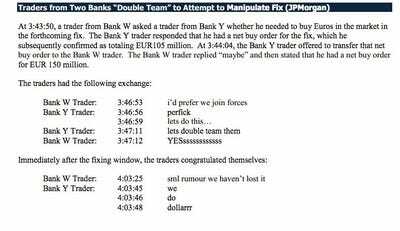 Five major banks — including UBS, the Royal Bank of Scotland, JPMorgan Chase, HSBC, and Citibank — just got slammed with $US3.4 billion in finesfollowing alengthy probe over accusations that traders had tried to manipulate currency markets. Authorities in Switzerland, the UK, and the US were all involved in the investigation, which resulted in the biggest set of charges ever levied by British financial regulators. 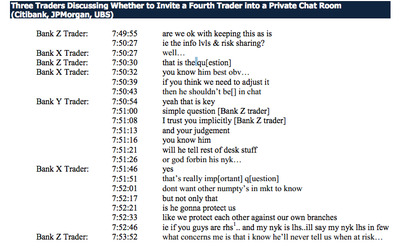 Such examples of “unacceptable banker behaviour” are captured in chat transcripts among traders and released by the US Commodity Futures Trading Commission as part of its investigation. In the clip below traders from two different banks manipulate fixing windows and proceed to congratulate their team’s effort. 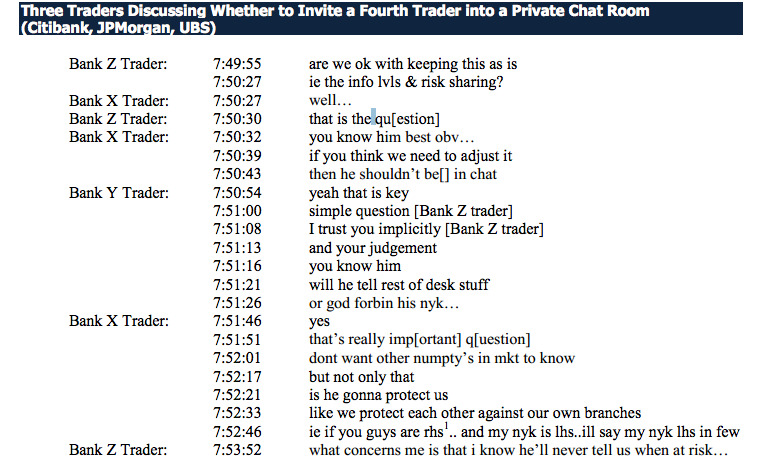 In another instance of misconduct, three traders from Citibank, JPMorgan, and UBS discuss whether to invite a fourth trader ino their private chat room because they aren’t sure whether they can trust him. The examples go on and on; we suggest you head over to the CFTC website for more. All of the listed banks cooperated with the investigation. According to the FCA, the fines would have been 30% higher if the banks listed hadn’t cooperated with the probe. An investigation into Barclays, one of the large banks notably not mentioned in the list, is still ongoing. $US1.4 billion in fines from US regulators (the Commodity Futures Trading Commission). $US138 million in fines from the Swiss regulator. $US1.7 billion in fines from UK regulators (the Financial Conduct Authority). For each bank, this is the combined charge from the three regulators, according to Bloomberg. UBS: $US800 million in fines. 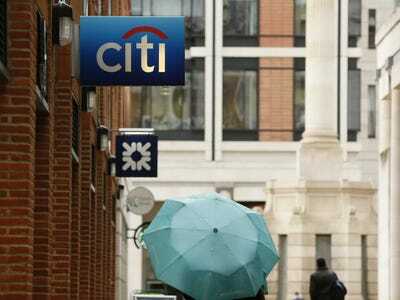 Citigroup: $US668 million in fines. JPMorgan $US662 million in fines. RBS: $US634 million in fines. HSBC: $US618 million in fines. These banks and plenty of others have been reporting that they have set aside hundreds of millions of dollars to prepare for these charges, which have been a long time coming. RBS is the first bank to report that it is reviewing the conduct of some staffers still at the bank: It has 50 former and current employees under investigation.